The Edifier E25HD Luna HD Bluetooth Optical DSP 74W Speakers has more to offer featuring a stylish design, smooth curves and piano finish. A fantastic accent piece for any room! Your TV has never sounded this good. Providing depth and power, equipped with Digital Signal Processing (DSP) and Dynamic Range Compression (DRC), the E25HD brings you closer to the actors in every movie experience. 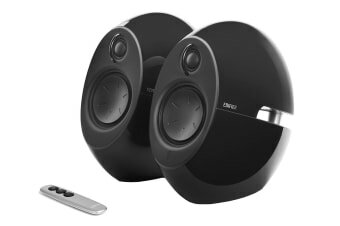 Clear sound will make you want to connect your gaming system, DVD and TV to the stylish Bluetooth speakers. Play top hits and new movies through the mighty E25HD. Featuring 3” bass driver and ¾ “ silk dome tweeter in each speaker, it will feel so realistic that you’ll forget you are listening from home. Amplifiers in each speaker with professionally calibrated electronic crossover will make your room pop. And if that’s not enough, each speaker has a twin passive bass radiator amplifying the sound to its max. Control volume, power and mute settings on the touch sensitive control located on the speaker. A stylish, easy-to-use remote control also accompanies the Bluetooth speakers to tame the powerfully small beast.